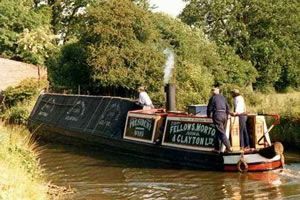 PRESIDENT was built in 1909 at a cost of £600 in Fellows, Morton and Clayton's company dock at Saltley, Birmingham; and registered on 23rd June. One of the directors of the company, Joshua Fellows, gave his name to the distinctively shaped "Josher" hull which has riveted wrought iron sides and a 3 inch elm bottom. The company built and operated 31 steamers between 1889 and 1931. The specially developed compound steam engine and coke fired boiler took up much valuable cargo space. 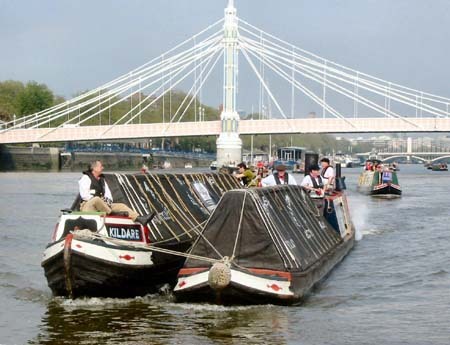 Steamers could carry only 18 tons compared to over 25 tons in a horse drawn boat, but were powerful enough to tow several unpowered boats (called butty boats). 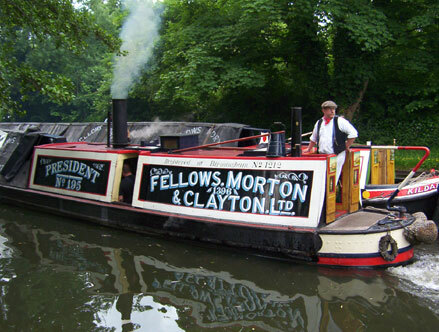 Steamers usually worked "fly", that is day and night, on the canals between London, Birmingham, Coventry, Derby, Leicester and Nottingham. 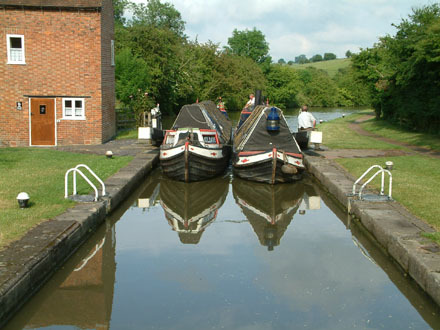 The busiest part of the route was between London and Braunston. 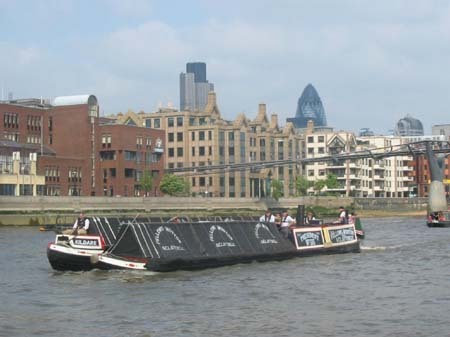 Here steamers often unloaded or exchanged cargoes and butty boats, returning to London or working alone to Birmingham where narrow locks made it easier to use a horse rather than tow the unpowered boats. 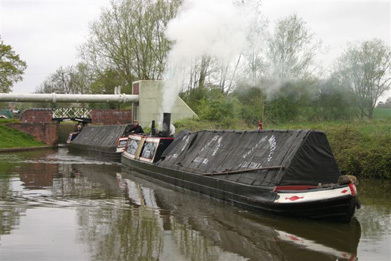 Steamers usually took 54 hours between London and Birmingham non stop using about 1 ton of coke as fuel and drawing water direct from the canal. The problem of lack of space for cargo and crew was solved by the introduction of the compact Swedish Bolinder Crude Oil engine. 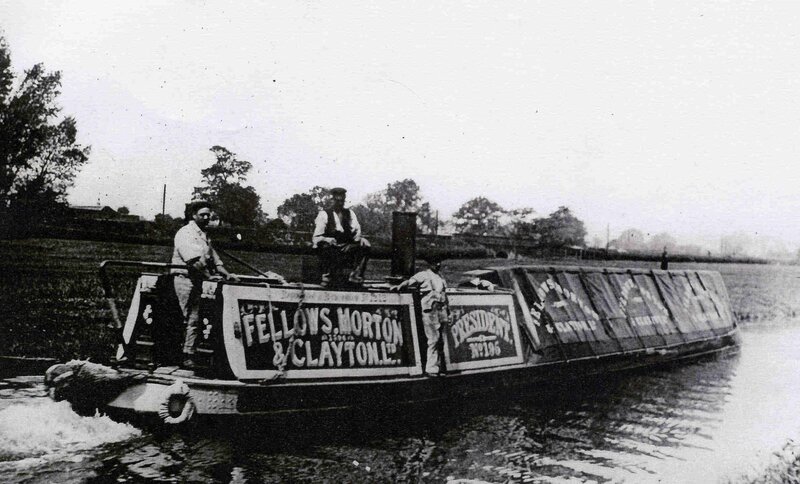 Fellows, Morton and Clayton tried their first motor boat in 1912 and other steamers were soon being converted. 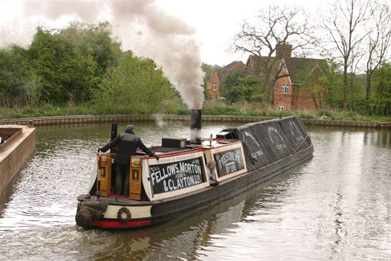 President had her boiler and engine replaced by a 15 horse power Bolinder in 1925 and returned to the FMC fleet as a Motor Boat. 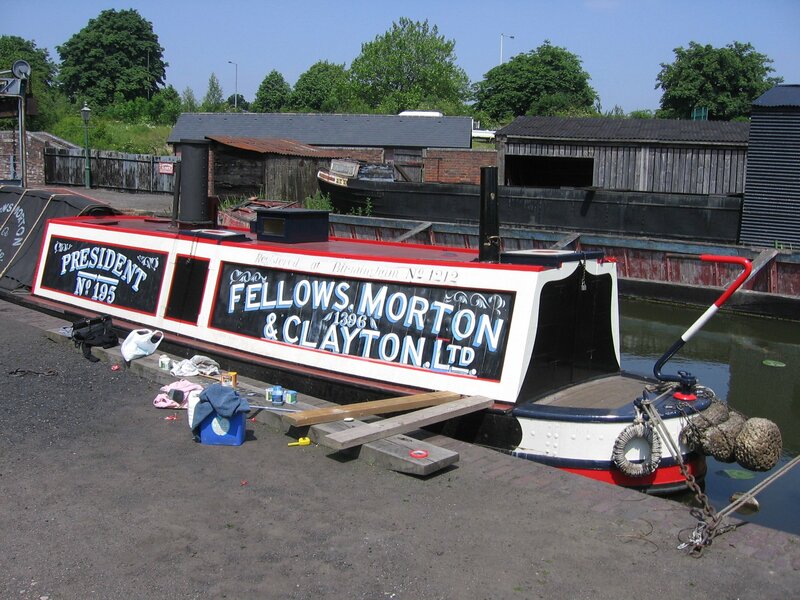 With its carrying capacity increased by nearly 8 tons and the newly introduced colour scheme of red, yellow and green, PRESIDENT became part of the Fellows, Morton and Clayton motorised fleet and was soon able to tow a butty direct to Birmingham on the newly formed and widened Grand Union Canal. 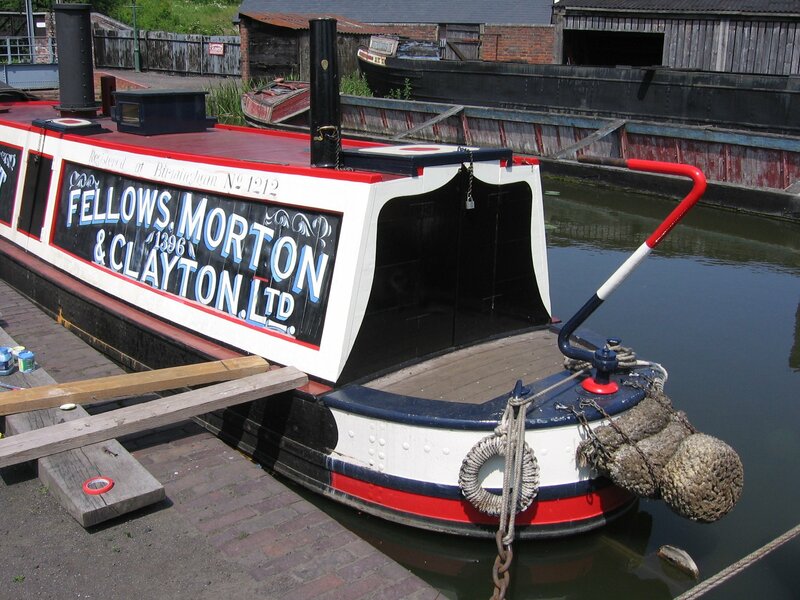 New routes and cargoes probably took PRESIDENT to Ellesmere Port, Liverpool and Manchester before she was sold in 1946 to the Walsall based coal carrier Ernest Thomas, a director of Fellows, Morton and Clayton. 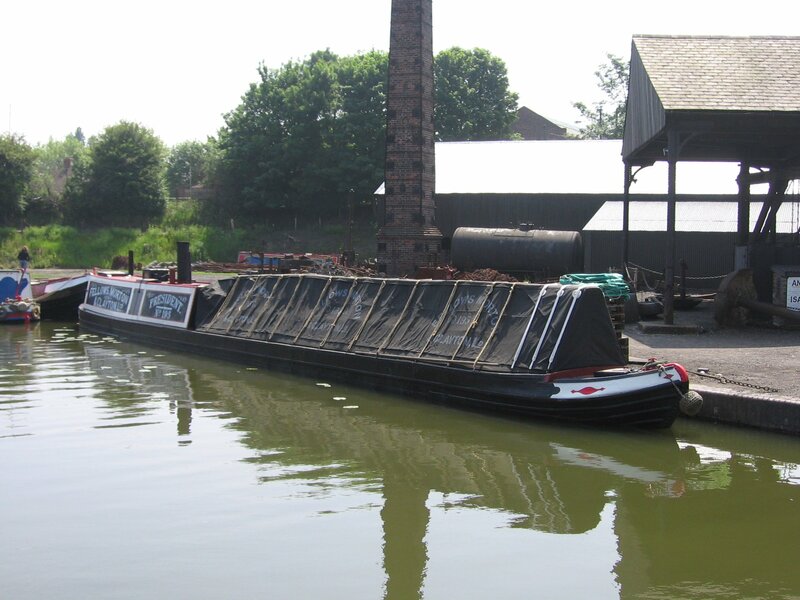 PRESIDENT was resold to George and Matthews of Wolverhampton to carry coal in 1948, the year in which canals were nationalised. 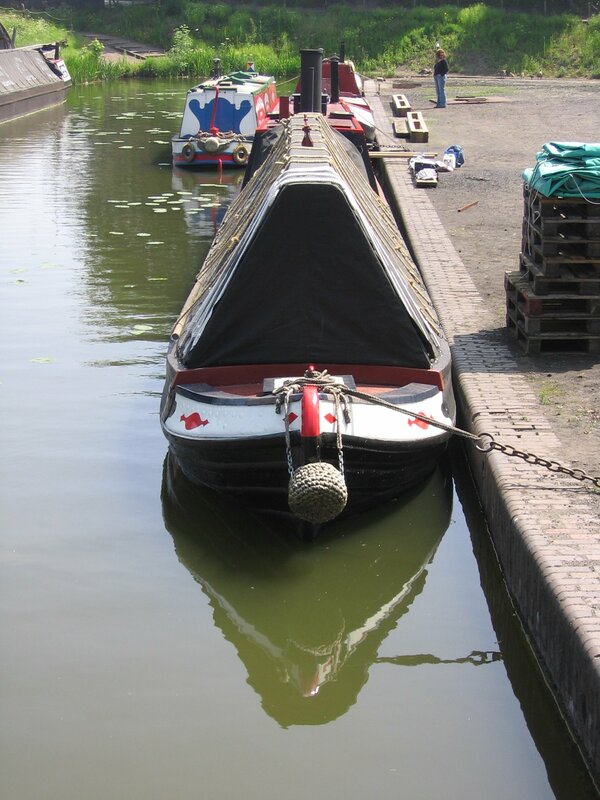 She ended her working days with the British Waterways northern maintenance fleet based at Northwich working on the Trent and Mersey, Macclesfield and Shropshire Union Canals. 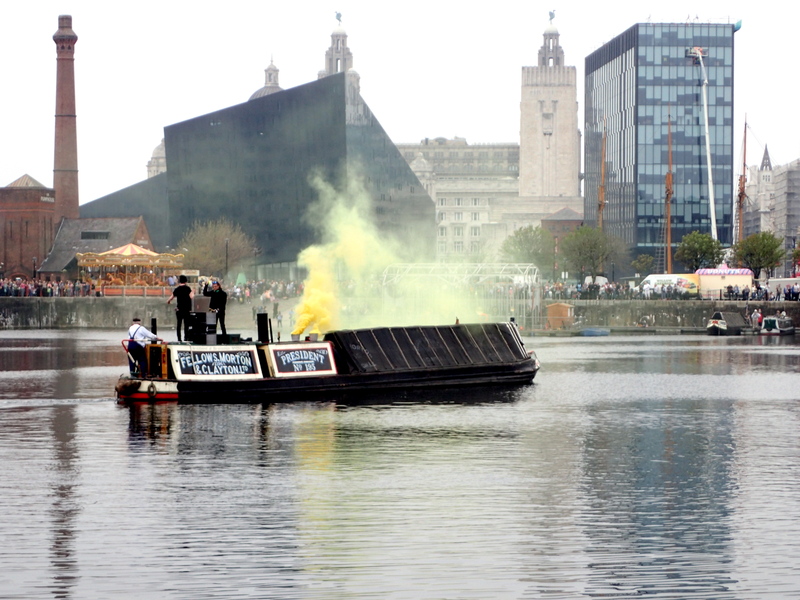 Advertised for sale as a derelict hull in 1973, PRESIDENT was bought by Nicholas Bostock and Malcolm Braine for restoration to its original appearance complete with working steam plant. 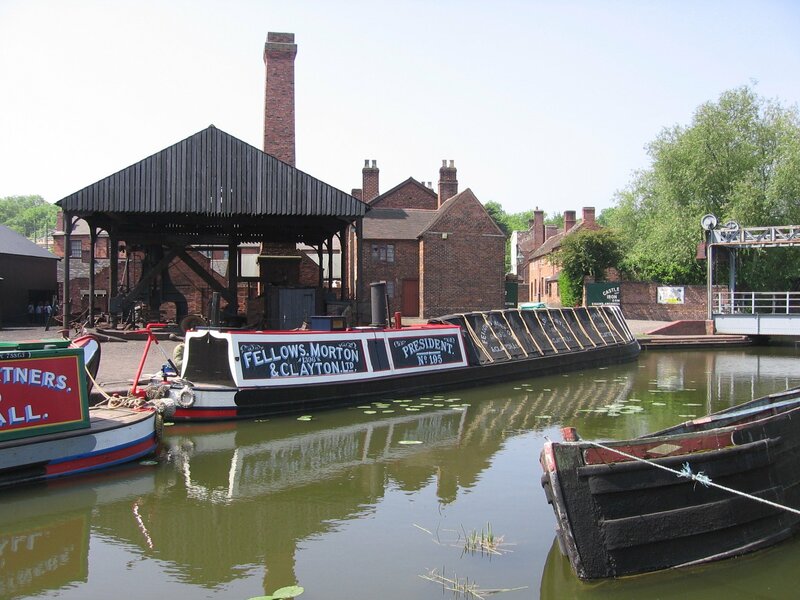 After extensive major repairs to the hull and building a complete replica cabin and boiler room, the major difficulty was finding a suitable engine and boiler, because the originals had been scrapped. 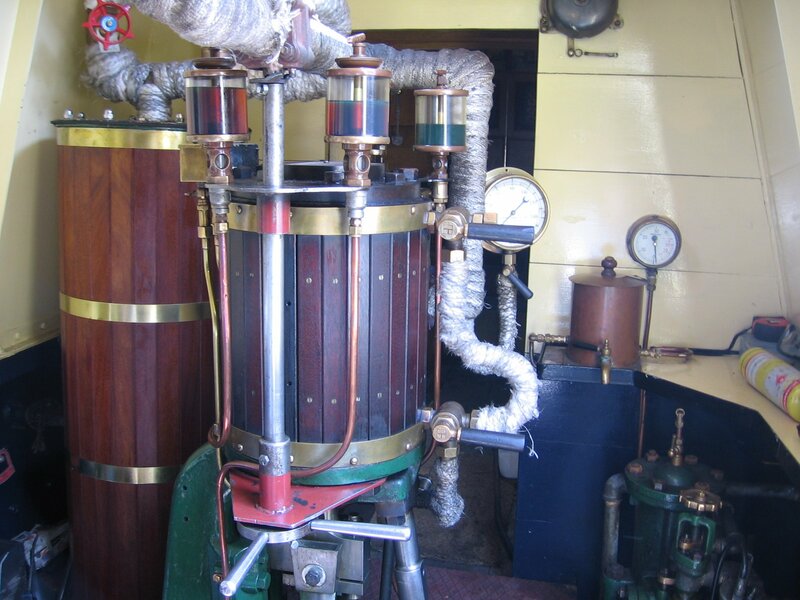 A 1928 vintage Muir and Findley boiler of "Scotch" return type, virtually identical to the original but working at 100 PSI was installed along with a contemporary simple twin cylinder steam engine, originally from a Thames launch. The boiler is fed with filtered canal water by a 1927 Worthington Simpson horizontal steam pump. 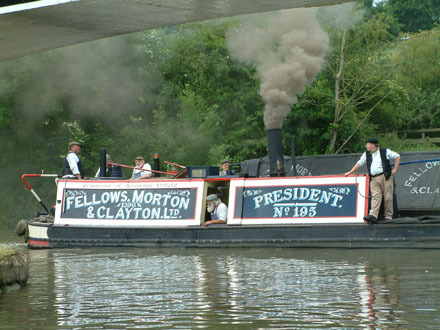 The President Steamer Company operated the boat from 1978 as a museum piece throughout the canal system. President was bought by the Black Country Living Museum in January 1983. Friends of President was formed in October 1984 to assist in the operation and maintenance of this unique vessel. In 1990 the Muir and Findley boiler was replaced by a Cochran dryback return flue boiler. During 2001 to 2003 PRESIDENT underwent a major refit, with new steam engine and pipework, new cabin and major hull repairs. Click here for a 360o virtual tour of PRESIDENT. Source: Harald Joergens Photography.